2011-01 – Wir brauchen Deine Hilfe! | We need your help! "CENTRO DE ENSEÑANZA CORAL (CEC)"
Women´s programs where almost 40 women of the community have Bible studies, crafts, prayers, singing and many other activities. Children´s program which involved over 50 children in games, crafts, videos, singing, etc. The school now is painted. 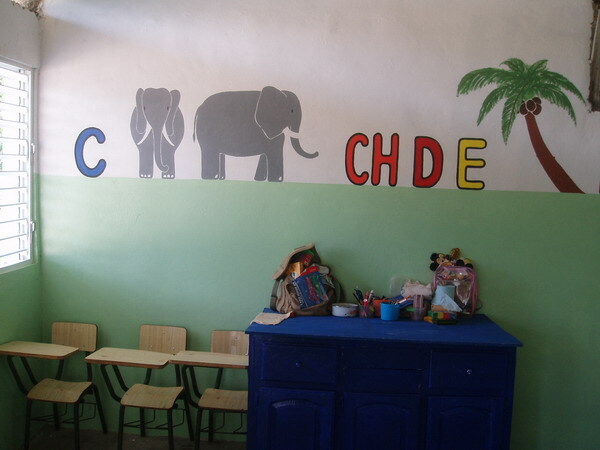 The front and the classrooms of the second floor of the school have a different view because of the nice painting and the sign with the name of the school that it has now. Two more classrooms on the second floor have a bright and nice floor., it means that it is going to be cleaner and nicer, and besides that, we will have more room for many other students. We will have permanent electricity at the school because of the New Genartor the missionary team donated. We thank God for this church, and praise the Lord for leading them to come to the Dominican Republic and help us to continue working with our children. THANK YOU, JACKSONVILLE UNITED BAPTIST CHURCH FOR GIVING TO THE LORD, WE ARE SO GLAD YOU CAME IN 2011! The Viloria Zayas family, the teachers, the students and the parents of Centro the Enseñanza Coral, in Cabarete DR.